Thinking about implementing an email marketing program as a part of your larger marketing plan? Do you feel like the process of implementation is a little daunting? But you always have to start in one place. 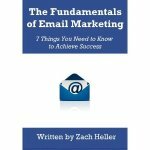 Because without this one thing figured out, there can be no email marketing program. Will you buy a list? I don’t recommend this approach. Will you build your own list? The answer should be yes. So the first thing you have to do is start your list. This requires a form for people to fill out and give you their email addresses. It requires providing a reason for them to give you their email address, ie. the promise of discounts or exclusive content. And it requires you to promote your email signup on your site, with social media, or in paid advertisements. So start at the beginning, even if you don’t know what comes next.